The Bowerman Presentation is just two days away! We’ll find out the winners of collegiate track & field’s highest honor on Friday night. The men’s finalists for The Bowerman are Christian Coleman, Fred Kerley and Lindon Victor, while Maggie Ewen, Keturah Orji and Raevyn Rogers are all vying for the women’s version of the largest trophy in collegiate sports. One thing all six finalists have in common is that they made history and all set collegiate records in 2017. Never before had that happened in the history of The Bowerman, which dates back to 2009. To whet your appetite for the big night, we produced a 15-second teaser which can be found embedded below and on our Facebook page for The Bowerman. 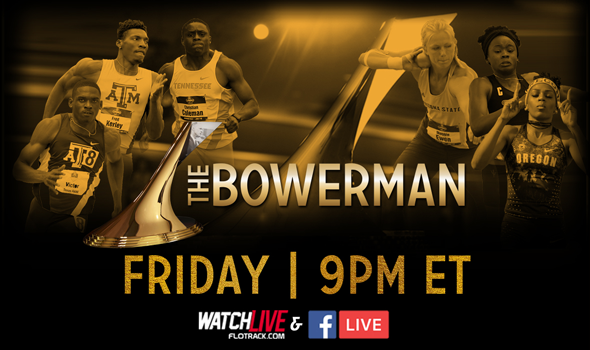 Remember: You can watch The Bowerman Arrival Party and Red Carpet Show exclusively on FloTrack starting at 8 pm ET with The Bowerman Presentation airing on FloTrack and Facebook Live an hour later. The Bowerman Arrival Party and Red Carpet Show will be co-hosted by FloTrack’s Ryan Fenton and 2010 The Bowerman winner Queen Harrison. ESPN’s John Anderson is back to host The Bowerman Presentation for the sixth time in the past eight years. We don’t know who’s going to win yet, but one thing we do know is that it will be a heck of a party on Friday as we fete the best of the best in collegiate track & field.